Attending church somewhere for the first time can be intimidating. “I know my child is going to be too noisy.” Lord of Life is made up of many families with young children so children are welcomed. However if you would like a place to take your child if she/he becomes noisy, we have a designated area in the narthex (lobby). The service may still be seen through the windows and heard through the speakers. “Everyone will know I am new; I won’t know what to do.” Each Traditional Service follows a written liturgy from the hymnals in the pews. You will receive a bulletin as you enter with instructions and page numbers. Songs are either within the bulletin or listed by number. Pastor also instructs the congregation when it is time to stand or sit. The Blended/Contemporary worship is outlined in the worship folder you receive as you enter the Sanctuary, with direction provided by Pastor. All of the words for all the worship services are on screens on the front wall, so you can follow the worship there. We come to the altar for Communion beginning with the right side of the church. 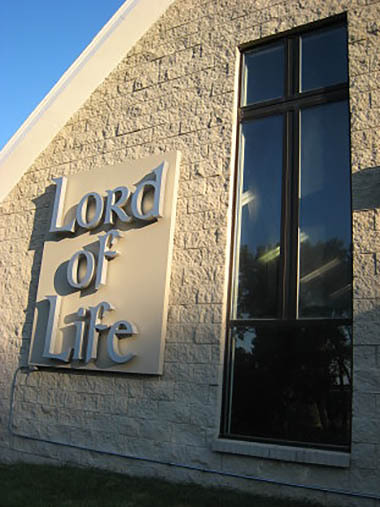 If this is your first visit to Lord of Life, you may wish to sit where you can follow those who are familiar with the procedure. “I am afraid I will say or do something wrong.” All of us have felt this way when in a new situation. But we hope you see the people of Lord of Life to be ordinary people like yourself. We want to accept you as you are and help you become what Christ wants you to be. We hope this material has answered most of your questions about worshiping God with us at Lord of Life. If we did not answer all of your questions, feel free to phone us or ask a greeter as you enter church on Sunday. Hope to see you soon!